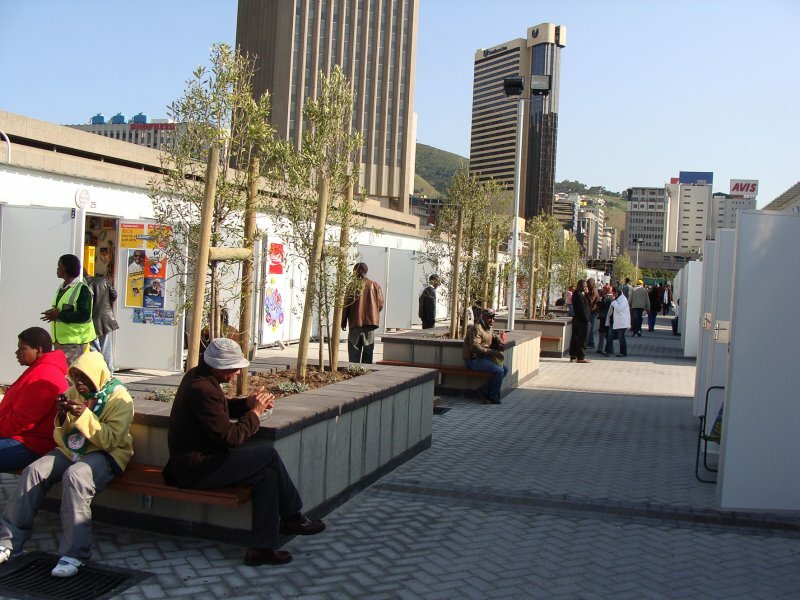 Although they did not benefit from extra sales during the recent 2010 World Cup, informal traders on the Cape Town Station deck are delighted with the upgrades to the area as a result of infrastructure spending kick-started by the tournament. Before the World Cup came along, the 150 traders on the station deck ran their businesses from makeshift tents and shacks. The area was also filthy and smelled of urine and garbage. But a R23million upgrade to the station deck has cleaned the area up and traders now have specially designed kiosks from which to operate. Kiosk rentals range from R280.00 per week for those working with food, to R245 a week for those trading dry goods or services such as hair salons. Trader Jack Mjekula, who operates a restaurant on the deck, said like many others before the World Cup she operated her business in a shack built of zinc sheets and Cape Town’s infamous rats often found their way into the structure. She said now she is renting a “decent kiosk” for R280 per week, including electricity. “Although we didn’t profit from the Fifa World Cup, it has left us with a good trading area,” said Mjekula. Lucky Ogwuaba, who sells shoes, said the revamp was “very nice” and hoped it would attract customers so he could make a good profit. “Because of the World Cup, they started building these things. We are happy,” said Ogwuaba. Customers are also pleased with the station deck upgrade. Thembani said that before the upgrade the station deck was filthy and a home to “flies and rats” but now there is a “huge difference”. There are also benches to relax on and trees have been planted. “We buy food in a nice place and sit in a nice place. All these kiosks and the toilets are clean,” said Thembani. Rayyaan Coetzee, 49, said that from a customer’s perspective the station deck is now “well-organized and cleaner”. “It looks 100 percent better and it looks as if it’s going to withstand the Cape Town winter weather,” remarked Coetzee. Brenda Thebe, an accountant who was buying bags for her children, said the revamped station deck is “awesome”. “It’s nice and clean and I feel very safe compared to before,” said Thebe, adding that the kiosks are numbered which makes them easier to identify. The current kiosks are temporary, explained Intersite project manager Pierre Cronje. Cronje said Intersite manages property belonging to the railways group PRASA and had provided 149 temporary trading units just before the start of the World Cup. It is noce that the City of Cape Town has revamped the Cape Town station. It looks beautiful than ever and we hope it is maintained and stay clean as it is now. Peter Luhanga, journalist from West Cape News, keep us updated so we may know if the station is not kept clean by whoever is supposed to clean it. Now i can take my siblings via the Cape Town station with no hustles, compared to before, when i felt embarrased walking with them in the previous dirty station. You can try phoning Spoornet and asking for their property managing division Intersite or phone the City of Cape Town. Numbers are in the phone book. Could u pls supply a contact no or online application forms asap..n how long after application do we wait?